There’s been some shocking weather in Dublin over the last 36 hours – pretty steady rain with some fog and chilly mist thrown in for good measure. While I’m a big supporter of throwing on the wellies and going puddle jumping, there is only so much rain two parents and one toddler can take and only so many hours of Peppa Pig that can be watched. 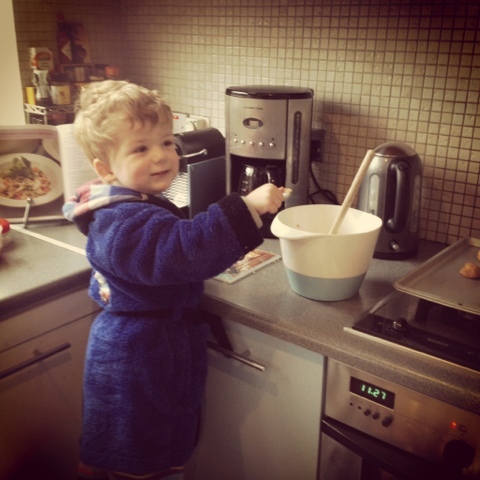 Fortunately, my little man has developed an interest in the kitchen, so that kept us entertained for a while yesterday. Maybe it’s the fact that I’m always chopping something, or the fabulous set of kiddie cookware that his godmother gave him for Christmas, but he’s gotten very curious about pots bubbling on the stove and loves anything that involves cracking an egg. Here are two store cupboard recipes perfect for rainy day baking with a small person. The first is this genius recipe from Food52 founder Merrill Stubbs. With only five ingredients and an opportunity to use the electric hand mixer, this is the perfect recipe to occupy little hands, fill your house with a sweet, buttery fragrance, and accompany the necessary rainy day cup of Earl Grey. Mix ingredients. Roll into balls. Flatten with fork, bake on parchment-lined try for 10 minutes at 350F/180C degrees. Try not to eat them all in one sitting. It’s a struggle. Ah would you look at him! He looks delighted with himself! Ed told me to look at the picture of his grandson, your son is a cutie pie! By the way, very nice presentation, love to cook as well. Making eccles cakes for Valentines day, yum yum! Happy cooking!! Free Library of Philadelphia, an acquiantance of Ed Saeger.